The first Italian States stamps for the Duchy of Parma and Piacenza were issued in 1852. The Duchy of Parma and Piacenza, was originally part of the Duchy of Milan. The Papal States conquered the territory around Parma in 1512, after which the Pope gave the territory to Pier Luigi Farnese. Later, the territory around Piacenza was also given to the Farnese family, creating the Duchy of Parma and Piacenza. The duchy was ruled by the House of Farnese until 1731, when the family became extinct. After the Napoleonic Wars, the duchy was ruled by the House of Bourbon, and it remained under Bourbon rule until the abolition of the duchy in 1859. Most of the authentic stamps of Parma have defective impressions. These include frame defects and misplaced or missing elements in the inscriptions. For the collector that is interested in studying and collecting plate varieties, the stamps of Parma offer a great number of specialization possibilities. The five definitive Italian States stamps for the Duchy of Parma shown above were issued on June 1, 1852. The stamps are typographed on unwatermarked paper, and they are imperforate. They were printed in sheets of 80 stamps, divided into panes of 20 stamps. The common design features the Crown of Parma, over a circle containing the Fleur-de-Lis. 05 C. (1852 - Sc. #1) - Black on Yellow, Black on Pale Greenish Yellow. 10 C. (1852 - Sc. #2) - Black on White. 15 C. (1852 - Sc. #3) - Black on Pink. 25 C. (1852 - Sc. #4) - Black on Violet. 40 C. (1852 - Sc. #5) - Black on Blue, Black on Pale Blue. The three definitive Italian States stamps for the Duchy of Parma shown above were issued between 1854 and 1855. These stamps have the same attributes as those issued in 1852, except that they were all printed on white paper. 05 C. (1854 - Sc. #6) - Orange Yellow on White, Lemon Yellow on White. 15 C. (1854 - Sc. #7) - Red on White. 25 C. (1855 - Sc. #8) - Red Brown on White. There are forgeries of all the Italian States stamps of the Duchy of Parma. Forged postmarks on original stamps also exist. The illustration shown above, from the Serrane Guide, features the major attributes of the original stamps and the attributes of some of the most commonly encountered forgeries. Having a cheap authenticated reference stamp is a great advantage, as it can be used for comparison in the elimination of many of the forgeries. Some of the common attributes to look for, that will reveal many of the forgeries, are the inscription letters not being aligned, the inscription letters being too wide or not high enough, missing dots in the upper inscription tablet, the positioning of the crown, and the positioning of the Fleur-de-Lis. 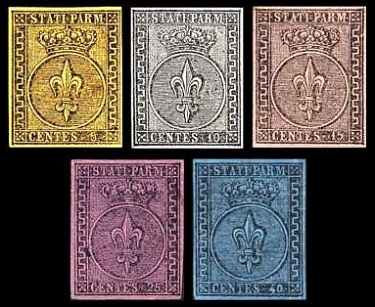 The three modified-design definitive Italian States stamps for the Duchy of Parma shown above were issued between 1857 and 1859. These stamps are typographed on unwatermarked paper, and they are imperforate. They were printed in sheets of 64 stamps. 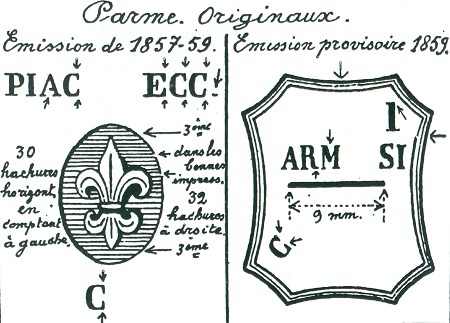 The common modified-design features the Crown of Parma above a shield containing the Fleur-de-Lis. The background behind the shield and the inscriptions is colorless. 15 C. (1859 - Sc. #9) - Red. 25 C. (1857 - Sc. #10) - Red Brown. 40 C. (1858 - Wide "0" - Sc. #11) - Blue (shown). 40 C. (1858 - Narrow "0" - Sc. #11a) - Blue (not shown). 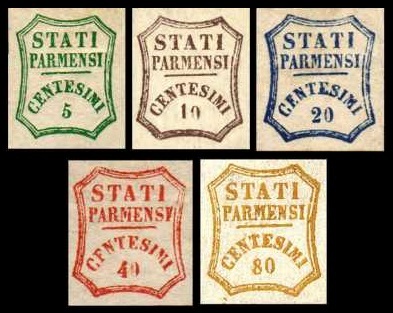 The five definitive Italian States stamps for the Provisional Government of Parma shown above were issued on August 27, 1859. The stamps are typographed on unwatermarked paper, and they are imperforate. They were printed in sheets of 60 stamps. 05 C. (1859 - Sc. #12) - Yellow Green, Blue Green. 10 C. (1859 - Sc. #13) - Brown, Deep Brown. 20 C. (1859 - Sc. #14) - Pale Blue, Deep Blue. 40 C. (1859 - Sc. #15) - Red, Brown Red. 80 C. (1859 - Sc. #16) - Olive Yellow, Orange Yellow, Orange Bister. 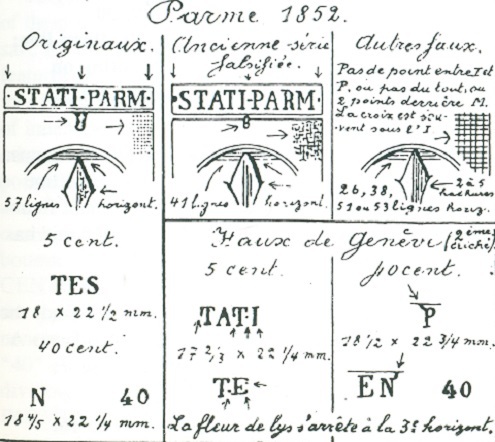 The illustration shown above, from the Serrane Guide, features the major attributes of the original stamps of the 1857 issues and of the 1859 issues. Deceptive and dangerous forgeries exist for both of these groups of stamps. All of the forgeries are lithographed. Having reference examples of the original stamps is a great advantage in eliminating the forgeries. 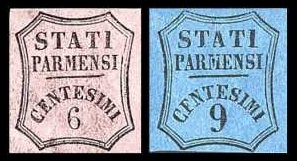 The two newspaper tax Italian States stamps for the Duchy of Parma shown above were issued in 1853. These stamps have the same characteristics of the later definitive provisional government stamps of 1859, with the exception that they are printed on normal tinted paper. 06 C. (1853 - Sc. #PR1) - Black on Rose. 09 C. (1853 - Sc. #PR2) - Black on Blue. These stamps were produced on thin, semi-transparent tinted paper in 1857, but they were never officially issued, and they were never used. Unused examples (Sc. #PR1a, PR2a) are available, and they are not expensive. The Italian States stamps of Parma were replaced by those of the Kingdom of Sardinia during February 1860. Collecting the Italian States stamps of Parma can become a rather expensive venture. In the 2017 Scott Standard Postage Stamp Catalogue, depending on the variety, the prices can range from under one-hundred dollars to over one-hundred-thousand dollars. Bearing this in mind, the collector should only buy high-priced stamps that are properly authenticated and / or certified. If not, they should make sure the seller guarantees the stamp, should they decide to have it authenticated and then find out that it is a forgery. The last two Dukes of Parma and Piacenza are shown above. Duke Charles III reigned for only five years, and his authoritarian policies made him unpopular with many of his subjects. On March 26, 1854, Charles was fatally stabbed, and he died from his injuries on the evening of March 27, 1854. 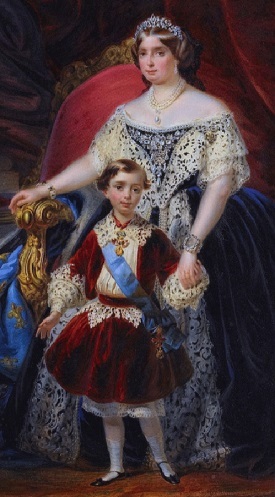 Charles' six-year-old son ascended to the ducal throne as Duke Robert I of Parma and Piacenza, and Charles' wife, Louise Marie Thérèse d'Artois, became the Regent of Parma and Piacenza. Unfortunately for the young duke, he would never reach his majority and become the sovereign ruler of Parma and Piacenza. The 1850's were a time of revolution in Italy, which would ultimately culminate in the unification of Italy by the Kingdom of Sardinia. 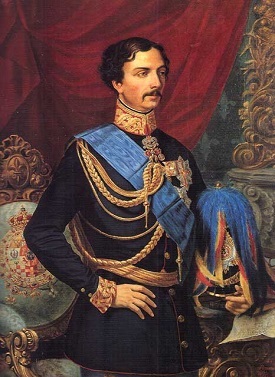 On September 15, 1859, Duke Robert I was officially deposed, and a provisional government was established. In December 1859, Parma and Piacenza merged with Modena and Tuscany to form the "United Provinces of Central Italy". In March 1860, the United Provinces were annexed to the Kingdom of Sardinia.